With the Pop Air Pro range of awnings, Kampa have brought inflatable awnings that are easy to set-up and pack-away to the owners of Eriba caravans or many other pop-up caravans. The awning is suitable for caravans with a rail height of 184 to 198cm. The Kampa Pop Air Pro 290 will provide highly beneficial, extra living space. The awning features Kampa's improved Weathershield Pro material that is used extensively throughout their range. A light and airy awning is ensured due to the good number of windows, all of which have interior blinds. The awning features Kampa's Weathershield Pro material, which now has improved UV protection and even better coatings to increase weather protection ( a Hydrostatic Head of 6000mm ). 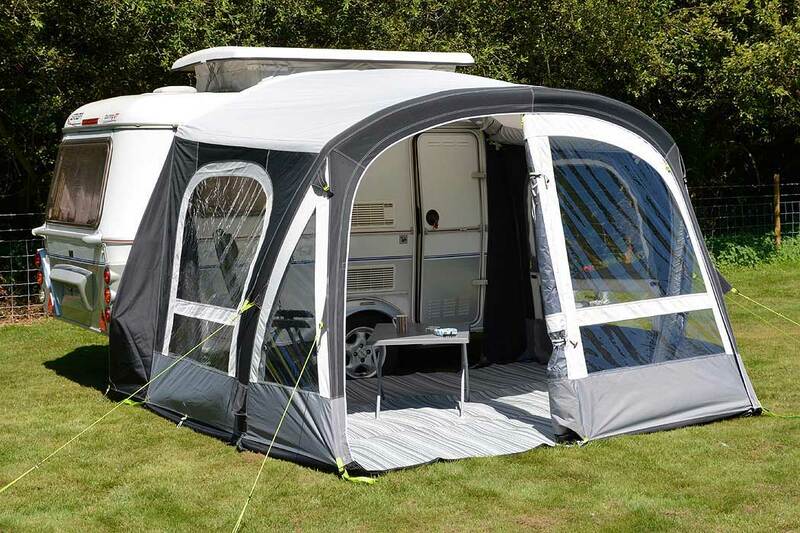 Like other Kampa awnings, the Pop Air Pro comes with a 2 year airframe warranty from Kampa themselves. The Kampa Pop Air Pro 290 uses an airframe ( also known as airpoles ) to replace classic metal or fibreglass poles. Because these kinds of awnings are m lighter in weight, they are typically less difficult to move and locate on-site than traditional awnings. The awning can be inflated rapidly and effortlessly through a single inflation point because all the poles are linked together. Additional benefits include the fact that the airframe is always connected and there is less probability of harm to your caravan because only soft materials are fixed against it. A high volume manual pump is supplied but an optional electic pump is available to make the process of inflating the awning even easier. The awning has front and side panels that can be unzipped and taken out. There is an extra inflatable tube to the rear of the awning that raises the centre height. This effectively turns the Pop Air into a full height awning and gives much greater headroom than otherwise would be achieved ( see photographs ). The awning has mesh panels to provide ventilation when needed. These can be opened and closed to suit your needs. 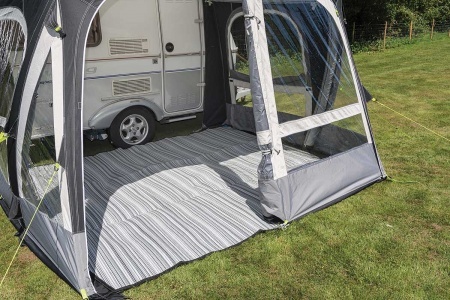 The Pop awnings also have an ingenious double height system that means they will fit both pre and post 2010 Eriba caravan models ( Note: The exception to this is the Pop Air Pro 260 that will only fit pre 2010 models ). This also means that a greater likelihood of them fitting other pop-caravans but this cannot be guaranteed. The main material that the awning is made from is important and the Pop Air Pro 290 is no exception. This awning uses Kampa's Weathershield Pro fabric, that is used on a great deal of their awning range. It has a proven track record, with its strong durability and high value weatherproofing. Despite these qualities it remains lightweight and manageable - great for easy set up and handling. Kampa have also made improvements to the UV protection and the coatings to make sure that Weathershield Pro continues to function well as an awning material. 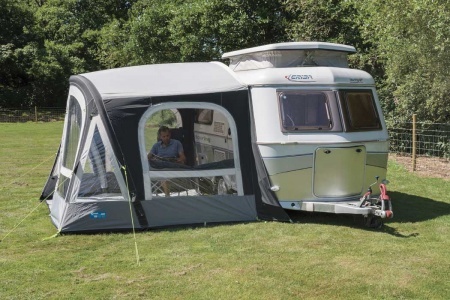 As with all Kampa AIR awnings, the Pop Air Pro is inflated through a single inflation point. This is a single point from where the entire awning is inflated including all airpoles and beams. This also means that there is only one valve ( on other brands, each of the poles are separate and need to be pumped up individually ). The Pop Air Pro 290 is also what Kampa call 'Sabre Link Ready'. The SabreLink Link System provides effective lighting to your awning. You can link up to three light strips together with each strip having 150 LED lights. This is an optional extra. Suitability: The Pop Air Pro 290 is suitable for caravans with a rail height of 184 to 198cm. It has been designed specifically for the Eriba Familia ( pre 2010 and post 2010 ) but may well suit other pop-up caravans.